Founded in Pleasanton, California in 2000, Pump It Up is the pioneer in birthday party entertainment. It is also the nation’s largest franchise of indoor inflatable entertainment centers for private parties. 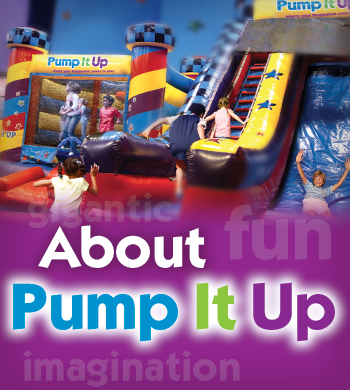 Today (16 years later), with over 150 centers across the country, Pump It Up is Kids' and Moms' Favorite Party Place! It has set the industry standard for indoor inflatable safety, while providing you and our community with a fun and healthy family activity. Pump It Up of McAllen opened in August 2010. It was an immediate success in the McAllen metro area, allowing parents to host children’s birthday parties in a PRIVATE, SAFE & FUN environment. At Pump It Up of McAllen, we strive every day to provide our customers with the best possible party experience. We focus on making your birthday child feel extra special on his or her day and that their celebration at Pump It Up of McAllen is THE party they never, ever forget. Pump It Up of McAllen has been awarded the company's Super Star Staff award for the past 5 years (2011 - 2015). Our friendly staff is constantly and thoroughly trained to make your experience at Pump It Up the best it can be. 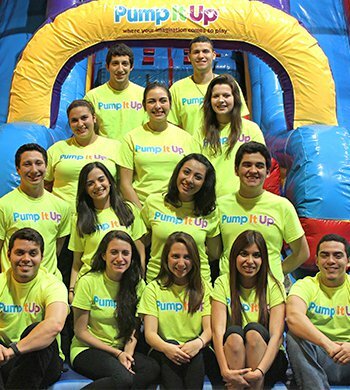 Want to join the Pump It Up team? If you meet our qualifications and are interested in a job with us, we'd love to have you!! Stop by Pump It Up to pick up an employment application. You can drop off your completed application along with your resume at 2720 Zinnia Avenue, in McAllen.